Strip Light (Toughness: 6) - Floats in mid-air and moves at medium speed. Releases circular strip lights which also float in mid-air but move slowly. Instead of homing in on you, they hang around the space overhead above you and make it dangerous for you to jump. If you wait for an opening before you jump, and hammer the small ones carefully, they are not too threatening. In the section above the starting room, in the ? box in the upper left just before the heavy door. There are few enemies around, and they are rather tough, so it is best if you can match the score with items. In the left one of the two ? boxes below the moving box near the end. You can be squashed by the moving box at that spot (even as a small character), so you have to get out quickly. In the section above the starting room, apparently completely surrounded by walls. You can enter through a fake wall on its left. You normally should have all the Espers by now, so you'll get a Magical Bonus. 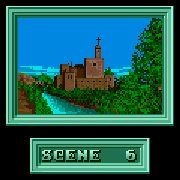 Scene 6 contains a number of large rooms, and some terrain traps involving concealed walls and fake walls and floors. You face a strip light in the starting room. Genzoh is a bit too unwieldy around here, so you should start with a kid. There are 2 blocks of concealed walls in the upper left, and half of the fires in this room are false. If you leave some food pots on the left as foothold, you can get out of this room without using the moving boxes. Naoki can often hit Zara, too. Don't waste time trying to destroy the strip light, but do pick off the small ones. 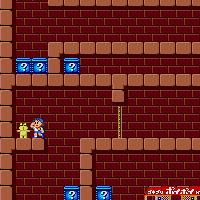 After getting the magic jar and the Secret Bonus, and forcing the heavy door (if the lamp appears, destroy it before doing so), you come to an area with 2 sections of fake floors; you need to fall through the second in order to proceed. You then fall through a long vertical passage to an ON gate. You can hit Zara if you time your fall well. In the lower large room, all the exits are blocked by concealed walls except for the second one from the left. In the large room above, if you leave some of the top food pots in the group on the right as foothold, you can leave the room easily. 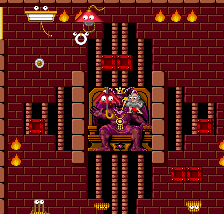 The final large room contains several threatening enemies surrounded by 33 food pots. You need to figure out a safe sequence of opening the food pots (unless you decide to neglect them). It is recommend that you try to open them from the top, and that you use Genzoh if you don't have the P power, or Akiko if you do. Since it is not easy to use the Stop icon against Satan in this scene, it is advisable to use Stop icons in one of the last, dangerous rooms. There are only 2 Smiley ? boxes in the final room. (The two other boxes contain Time UP items.) You'll get many more than 2 icons in the final room, and also you'll get more new icons than ? boxes at the start of scene 7, so it is a good idea to return to the previous room and deploy icons with the ? boxes there. For this reason, on your first passage through that room, you should use the fake walls to deploy icons so as to save the ? boxes for later. 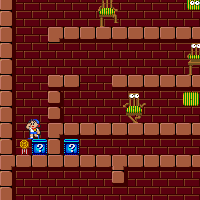 The Satan in scene 6 is surrounded by walls and dangerous moving boxes. Use Genzoh. Your best bet is to try to reach Satan through the shortest, most direct path, with minimum interaction with the terrain. After passing through the ON gate, lower your altitude just a little bit to avoid the fires above, and hover to the space directly above Satan. (Do not try to stand on the walls; the moving box will push you off. Rely on Genzoh's superb hovering while you wait for an opening.) When there is an opening through the moving box and the umbrella, drop down to Satan and hammer away. Try to avoid hitting the lamp, since it regenerates at a spot which tends to block your drop. Because of the long corridor between the two ON gates, the Stop icon and the broom are not effective for Genzoh, unless you manage to stop Zara inside the corridor. The All Gold Bonus in scene 6 is rather difficult to get, significantly more difficult than that in previous scenes. Many of the areas with the food pots contain threatening enemies. 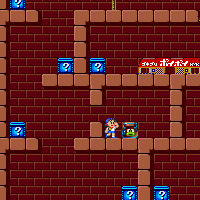 The starting room contains 12 food pots, and it is followed by long sections, including the Secret Bonus, before you'll find another food pot. Thus, it is a good idea to get the 1st set of 4 shortcakes and the 6th set of 8 candies, so that you leave this room at a break point. If you can manage it, maintain a modulus 2 count until you reach the room with 15 food pots. Here, if you are lucky and get either of the smaller sets (10 cups of pudding or 5 donuts), you should hammer once after finishing one set, so that you get the other and leave this room at a break point. However, if you get one of the larger sets, it'll take more work to get the All Gold Bonus. Try to avoid spending too much time in the next room for now. It is a good idea to get through it quickly and return for the food pots and ? boxes later. In the final room with 33 food pots, it is important to keep in mind where the break points are, until you are down to the last set. Because of the tight packing of the food pots, it is easy to pick up foods in the wrong order, even if you have hammered them with the right modulus count, and this is especially when you are on the broom. This page was last edited on 13 December 2010, at 21:01.